Time to start looking for coin blocks. 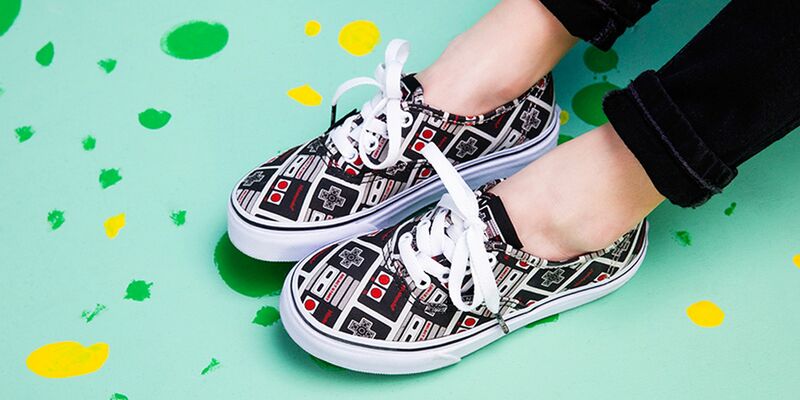 The collaborative line features shoes and apparel inspired by old-school characters of Nintendo’s past. We’re talking back in the day, before Link even met Epona. Exclusive artwork features popular games and characters, including Super Mario Bros., Donkey Kong, Legend of Zelda, and Duck Hunt. Other designs pay homage to the console itself. Each of Vans’ most iconic styles, like slip-ons, authentic, and Sk8-Hi have their own set of artwork to choose from, and apparel to match. Depending on the shoe, you’ll find subtle Nintendo-inspired design details. The lace-up style has tiny controllers on the lace caplets and game logos on the tongues. The shoebox itself even looks like a NES console. As for not-so-subtle details, fans will be delighted to know that the bottom of the soles say “GAME OVER!” A warning to any enemies who might cross you. The shoes range from $21 to $70 and apparel ranges from $10 to $59.50. You’re going to want to see everything in this line, so check it out here.